The XJ list converged on Harlan, Ky once again. Since we saw so little of the park last time we went back for a repeat visit. We got in lots of play time this trip. Friday's adventure ended in a slip and slide as we got caught in a rain storm on our way back to camp. The long muddy hill we started the day with was a big water slide for most of the group. Saturday we ran a super fun trail called Mason Jar. This trail starts with what looks like an impossible obstacle. 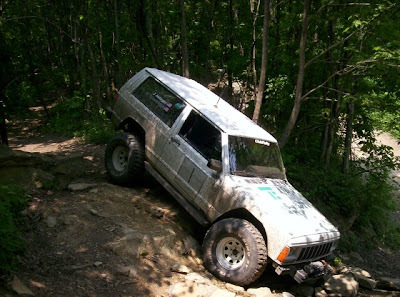 Our first Jeep made it over just to prove it could be done. Then the rest of us took the by pass. However this was no easy bypass. It was an extremely off camber run on the side of a cliff. Each jeep had to be strapped up for safety as we crawled through. A few busted taillights and some new pin striping seemed to cover most of the damage in the group.